Rising numbers of aging and sick make euthanasia an option? Is Vatsala Vedantam, former associate editor of Deccan Herald, drinking koolaid from the global depopulationists? Maybe not. It seems that her husband was diagnosed with cancer but he refused to accept it. Doctors put him on treatment and he died shortly afterwards. Instead of questioning the treatment, she has now become an advocate of legalized murder and unwittingly aiding the Rothshild agenda to depopulate the globe. I shudder when I read it! The job of doctors is to save lives. If doctors say that there is no hope for recovery, then it is for the family to decide to take the patient home and let the person die in peace. Nobody else has a say in this. Cancer patients face the most danger of being designated as “terminal cases.” Current cancer treatments are nothing but quackery as most patients die from the treatment rather than from the disease. After soaking the family for all they are worth, the hospital designates the patient as a terminal case and sends them home with a big bill. With legalized murder, hospitals will want to try this on more people. If private hospitals are allowed to bill the government, as they do in the West, then hospitals will be encouraged to put anyone they can find on the fast track to heaven. Euthansia is murder that hides behind a euphemism. If it is legalized, then global depopulation agenda will have a field day. 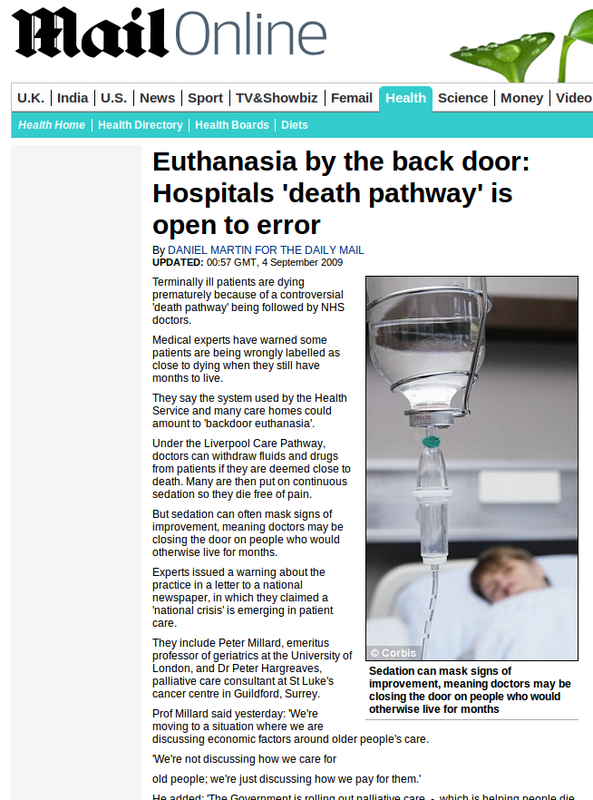 In the UK, many thriving patients have been dispatched to heaven under the innocuously-named “Liverpool Care Pathway.” (Daily Mail; Euthanasia by the back door: Hospitals ‘death pathway’ is open to error; 4 September 2009; http://www.dailymail.co.uk/health/article-1210848/Terminally-ill-care-scheme-death-pathway-warn-experts.html). It seems that LCP was a Malthusian experiment that could have been perfected in UK and then applied all over the world under the aegis of UN and WHO. The British Medica Journal’s Journal of Ethics recently published an article that argued for “post-birth” abortions. (After-Birth Abortions: Why Should The Baby Live; Guibilini and Minerva; http://jme.bmj.com/content/early/2012/03/01/medethics-2011-100411.full.pdf) Bill Gates famously mentioned at a TED conference that vaccine can help reduce global population. Many vaccines distributed WHO were found to have been laced with hormones that caused women to miscarry. Economists and other globalist penny-pinchers should not be allowed to decide who should live and who should not? Providing free quality healthcare for all is the solution. PEOPLE HAVE A RIGHT TO FREE HEALTHCARE, NOT FREE DEATH. Is Barack Obama A Homosexual? Two Alleged Ex-Partners Have Been Killed Execution Style!